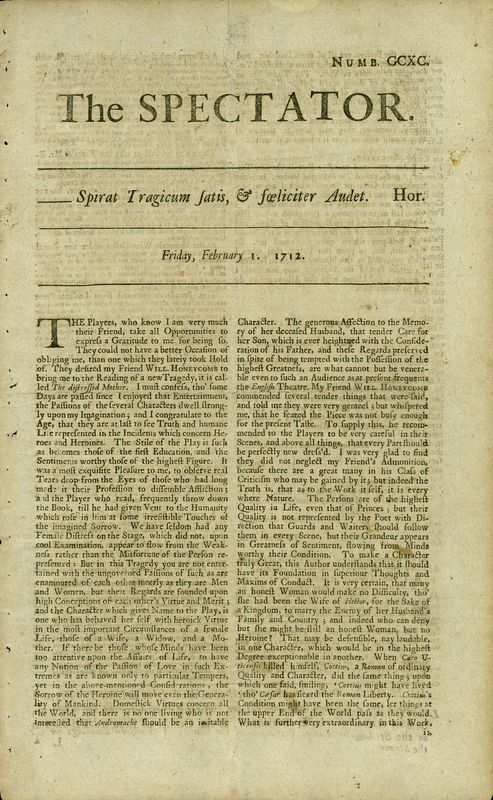 A forerunner to the great periodicals of the nineteenth century, the Spectator was a short-lived daily publication (1711-12; 1714). Edited by Joseph Addison and Richard Steele, it was a successor to Steele’s Tatler (1709-1711). Articles were written by the imaginary ‘Mr. Spectator’, who offered commentary on the London social scene and introduced several members of a ‘Spectator Club’, whose ‘histories’ and ‘commentaries’ also appear in its pages. Mr. Spectator notes in the first issue, ‘I have been often told by my Friends that it is Pity so many useful Discoveries which I have made, should be in the Possession of a Silent Man…I shall publish a Sheet full of Thoughts every Morning, for the Benefit of my Contemporaries’. The number of readers is hard to quantify, since the publication was part of the London coffee house culture, and one issue could be read by hundreds. [Joseph Addison and Richard Steele], “The Spectator, no. CCXC,” ourheritage.ac.nz | OUR Heritage, accessed April 22, 2019, http://otago.ourheritage.ac.nz/items/show/10802.